If you believe what you read in the guidebooks, then 27-year-old Maasai warrior Bonnie Lesimba should be deep in the African bush tending his cattle and fighting off - with his bare hands of course - the attention of marauding lions. But Bonnie is perhaps the new face of Maasai youth. He still wears the traditional garb - robes, colourful beads and dinky white leather sandals, as well as carrying a ceremonial club. However, he is one of a growing number of Maasai warriors who are rejecting the nomadic lifestyle in favour of more mainstream and lucrative jobs in the city. Bonnie is engaged in what may at first sight seem a rather unwarrior-like activity. He is a hairdresser, one who specialises in creating "rasta" hair styles, which involves weaving long strands of plaited hair into the cropped hair of his customers. "It may seem a strange job for a Maasai," he said. 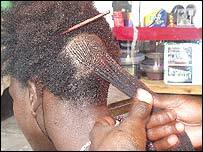 "But weaving hair is part of our culture. It's something we all learn from our parents." Bonnie works at the Msusi Maasai hairdressing salon, one of three salons or 'saloons' as they are sometimes called, on a short block in the Ilala Boma district of Dar es Salaam. There are perhaps up to 30 Maasai warriors milling around waiting for clients. Half a dozen or so of them hold an impromptu performance of a traditional Maasai song and dance, a type of tribal barbershop sextet, in an attempt perhaps to drum up some more business. Already there are three young women who are having their hair turned into a rasta style. Watching Bonnie and his team of three helpers at work is impressive. His quick hands and skilful manipulation of hair is one reason why the Maasai hairdressers have become so popular. Upendo Abbasi, who is one hour into the three hours it takes to finish the rasta style, has come from the other side of Dar es Salaam. "The Maasai people are the best at doing this style," She said. "They are a lot quicker than other hairdressers and the hair remains in place for a lot longer. It's worth travelling for." Seeing Bonnie Lesimba cooped up in the corrugated iron-roofed Msusi Mmasai salon, in deep concentration bent double over his customer, makes me wonder if he is really happy being a hairdresser. Should he not be out in the bush under the wide expanse of the African sky wrestling lions as the guidebooks suggest? "Times change and we have to adapt to these changes," he told me. "Of course, traditionally we were nomadic cattle herders, but as our herds became smaller, there was less work on the land. "So we had to find new sources of income. That's why many of us moved to the city." 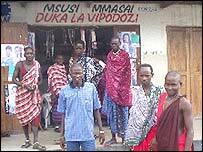 Maasai people, whose ancestral homeland straddles the border between Kenya and Tanzania, are now a fairly common sight in Dar es Salaam and other Tanzanian cities. Hairdressing is not the first new line of work they have tried. Many Maasai, whose reputation for bravery, rightly or wrongly precedes them, have worked as security guards or night watchmen at hotels and private houses, but according to Bonnie it is boring and badly paid work. "As a security guard you can earn just $50 a month, but hairdressing which is more interesting pays a lot better," he explained. Bonnie's customers pay anything from $15 to $40 for the rasta style, a considerable investment considering the average wage in Tanzania is just over $1 a day. Although he has to pay his helpers and rent for the salon, he makes good money. For now, rasta is the single most fashionable style among the men and women of Tanzania. More Maasai warriors are laying down their spears and moving to the city to take part in this lucrative business. As long as rasta remains popular then the Maasai are likely to continue weaving their way into profit.